When someone shares a Word document with you, the email you receive includes a link that opens the document in your web browser: in Word Online. Select Edit Document > Edit in Browser. If anyone else is working on the document, you'll see their presence and the changes they're making. We call this coauthoring, or real-time collaboration. 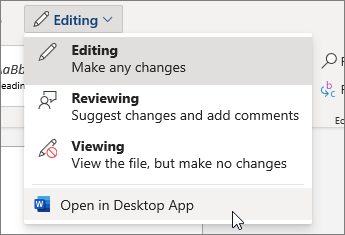 From here, if you'd rather work in your Word app, select Edit in Word, near the top of the window. Want a guided tour? Download this Collaborate in Word learning guide, or type Collaborate in the search box in File > New in Word (works best in versions 2016 and later for Windows).